Step aboard The Mekong Navigator, and enter a space filled with the nostalgic beauty of French colonial stylings alongside luxurious modern amenities. Relax on the sun deck and watch the lush scenery pass by as the ship cruises down the mighty Mekong River or explore hidden cultural gems with a dedicated guide, either way, be inspired by the rich culture and the resilient spirit of the local people. The 34-suite cruiser features a fitness centre, a spa, library and internet lounge, a convivial dining room and an array of spacious, well-appointed suites with luxury hotel standards. Throughout the voyage, the guests will be attended by the hospitable local crew in sophistication and comfort. A trip on The Mekong Navigator will be a full immersion in the luxury and romance of a bygone era while celebrating the beauty of the present. 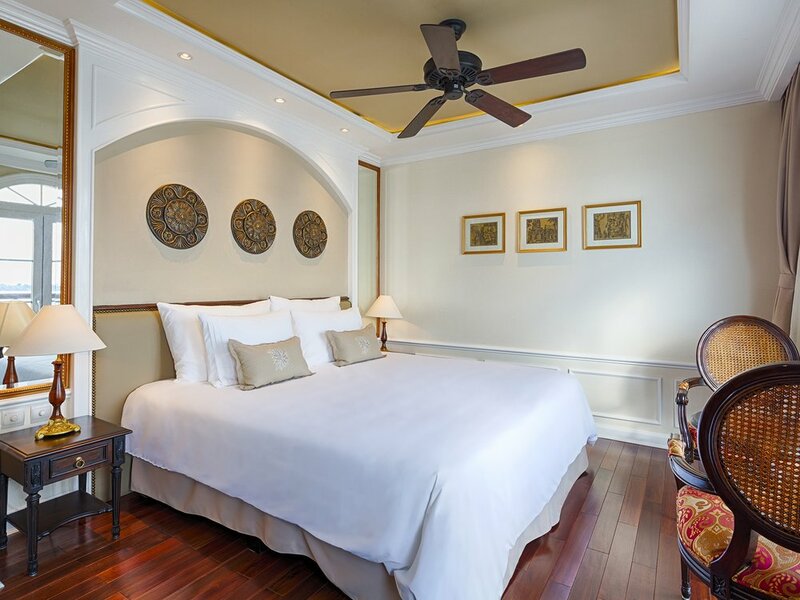 The suites aboard the Mekong Navigator have the grace and style of the French colonial era while incorporating modern conveniences and luxuries that rival the finest hotels in Asia. Spacious, well-appointed suites provide individual climate control, flat-screen televisions with a select range of movies, spa-quality robes, slippers and bath amenities, daily housekeeping with turndown service, fine bed linen, premium mattresses, duvets, your choice of pillows and newspapers delivered daily. There are five categories of suites ranging between 54 square metres to 24 square metres. Each suite features a luxury marble bathroom with rainfall shower, writing desk, hair dryer, flat screen LCD television with news, sports, movies and infotainment channels and minibar restocked daily. Grande Suite: Located in the front of the cruiser on the Orchid Deck (upper deck), the two Grande Suites offer the most luxurious environments on board. With 584 square feet (54 square metres) of space including the balcony, guests in the Grande Suite will enjoy panoramic river views through floor-to-ceiling glass windows, a private balcony with a generous seating area, a fully-stocked and complimentary mini-bar, complimentary laundry service, daily butler service, and special in-room dining options that are exclusive to Grande Suite guests. Prestige Suite: Located mid-ship on the Orchid Deck (upper deck), Prestige Suites provide guests with 387 square feet (36 square metres) of living space including balcony. Thoughtfully designed for comfortable living, the Prestige Suites provide an expansive bathroom with soaking tub and premium bath amenities, living area with sofa, private balcony, and daily butler service. Vista Suite: Located on the Lotus Deck (Main Deck), Vista Suites provide guests with 276 square feet (26 square metres) of living space including a French balcony with a spacious seating area, perfect for enjoying the dramatic sunsets along the Mekong River. Vista Suites are available with two twin-size beds or one queen-size bed, upon request. Signature Suite: Located on the Orchid Deck (upper deck), Signature Suites provide guests with 291 square feet (27 square metres) of living space including a private balcony where guests may enjoy a daily continental breakfast while enjoying the view. Signature Suites are available with two twin-size beds or one queen-size bed, upon request. Superior Suite: Located on the Jasmine Deck (lower deck), these Superior Suites provide guests with 256 square feet (24 square metres) of living space, brightened by two expansive porthole-style windows. Superior Suites provide a quiet sanctuary with plenty of room to relax. Superior Suites are available with two twin-size beds or one queen-size bed, upon request. Mekong Navigator offers a sophisticated ambience with a variety of places to relax and dine. There are plenty of venues onboard to relax, enjoy a drink or experience a culinary delight. 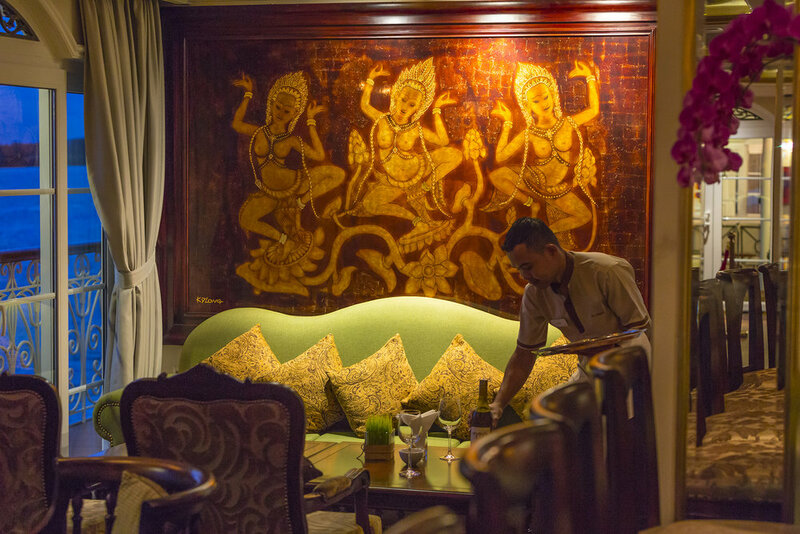 Each location is tastefully decorated in keeping with the ship’s French Indochina style. The attentive staff are ever ready to fulfil any of the guests’ needs. Le Salon Bar: Le Salon is an ideal place to relax with friends, recount the day’s adventures or simply unwind while marvelling at the passing landscape through the expansive windows. Guests may enjoy complimentary local beer and spirits, coffee, tea, and soda or choose from a selection of premium wines or liqueurs available for purchase. Le Salon is also the perfect place to watch live cultural performances in the evenings. Le Marché: A tribute to the incredible flavours of Southeast Asian cuisine, Le Marché will take you on a gastronomic journey. Guests can also enjoy a variety of western dishes. Le Marché provides casually elegant dining. Sun Deck: Choose the perfect chaise lounge in the sun or the shade and relax in style on the Mekong Navigator’s sundeck. Early risers can enjoy a front row seat for a spectacular sunrise. La Bibliotheque: It is the place to browse through a wide selection of books from authors who have also been enchanted by the beauty of Indochina. La Vie: La Vie fitness centre has the most advanced fitness equipment and features a luxurious spa that allows guests to travel in full relaxation mode.